Just as it is impossible not to take the honey (or the poison) that finds itself at the tip of the tongue, so it is impossible for a government servant not to eat up at least a bit of the King’s revenue. Just as fish moving under water cannot possibly be found out either as drinking or not drinking water, so government servants employed in the government cannot be found out (while) taking money (for themselves) (quoted in Bardhan 1997:1320). The 1990s have witnessed what Moisés Naím (1995) calls a global “corruption eruption”: allegations of systematic and generalized corruption have brought down several heads of state, Cabinet ministers and legislators. These allegations of corruption have touched every region of the world, regardless of cultural background, economic system or level of development: in Brazil and Venezuela, democraticallyelected Presidents were impeached following accusations of corruption; three Ministers in India were accused of corruption and resigned in disgrace; a Japanese Prime Minister resigned following charges that he had mismanaged public funds; and an Italian Prime Minister was toppled after being targeted by a corruption investigation conducted by a group of prosecutors who were subsequently investigated for similar improprieties (Rico and Salas 1996:39; Naím 1995:246; see also Johnston 1997 and Celarier 1996). In March 1999, the 20-member European Commission, including President Jacques Santer, resigned en masse, stung by a report by independent experts that accused the Commissioners of chronic cronyism and corruption (Whitney 1999). Has there been a quantum increase in corruption around the world? Why the increased attention being focused on corruption? The inherent difficulties in measuring the degree of corruption—either at a point in time or over time—make it impossible to assert unequivocally that corruption is more prevalent today than in the past. Tanzi’s (1998:560-564) tentative conclusion seems reasonable: the current interest in corruption probably reflects an increase in the scope of the phenomenon—because of an increase in recent decades in the role of the government in national economies, the growth of international trade and business that has created more situations for the payments of “commissions” (bribes), and privatization of state-owned property—and not just a greater awareness of an age-old problem. What is clear, however, is that corruption has been recognized as a development issue. Moreover, there is a willingness on the part of public officials in developing countries to discuss openly the problem of corruption and its effects. Reportedly, in a survey of more than 150 high-ranking public officials and key members of civil society from more than 60 developing countries, the respondents ranked public sector corruption as the most severe impediment to development and growth in their countries (Gray and Kaufmann 1998:7). Corruption has also been recognized by the World Bank and the International Monetary Fund (IMF) as an impediment to development. Thus, the IMF’s Guidelines on Governance (IMF 1997) reflect the consensus within that organization on the importance of good governance, including the avoidance of corrupt practices, for economic efficiency and growth. This paper is a preliminary exploration of issues surrounding corruption in Cuba’s transition to a market economy. The emphasis is on economic-related corruption issues, as opposed to those that are more focused on the political realm, although all forms of corruption issues are related. The paper begins with a brief overview of the economics of corruption. The second part reviews general issues related to corruption in transition processes of former socialist countries. The third part focuses on the manifestations of corruption in socialist Cuba. The paper closes with some general policy recommendations to control corruption in Cuba’s transition to a market economy. The potential for corruption exists whenever a public official has discretionary power over distribution to the private sector of a benefit or a cost (Rose-Ackerman 1997:31). Private individuals or firms are willing to pay bribes to obtain these benefits or avoid costs. National, state and local governments buy and sell goods, distribute subsidies, organize privatization of firms and provide concessions. Individuals or firms may pay off government officials to be included in the list of bidders for a project, to be selected as the winning bidder or to charge a higher price or deliver goods or services of lower quality than contracted. They may also pay bribes to obtain goods sold by the state at lower price or subject to a more convenient delivery schedule, to obtain access to credit or to foreign exchange, or to obtain a subsidy. Privatization of government-owned enterprises is conceptually similar to tendering for a large infrastructure project and therefore creates the same potential for corruption. National, state and local governments also enforce rules and regulations, levy taxes and enforce criminal laws. In performing these functions, governments can impose costs selectively and therefore affect the competitive position of firms in an industry. Individuals or firms may pay to get a favorable interpretation of rules and regulations, pay lower taxes (e.g., through a lower tax assessment) or import duties (e.g., through misclassification of imports or their undervaluation) or avoid application of criminal law (e.g., through payoffs of inspectors to overlook violations). Government officials often have a monopoly of information that is very valuable to outsiders. Private individuals or firms may pay government officials to obtain information on the bids of competitors, on the location of a highway or public works project, or on the confidential economic condition of a firm to be privatized. That is, the level of corruption depends on the degree of monopoly exercised by the state over the supply of a given good or service, of discretion enjoyed by a government agency in making resource allocation decisions, and of accountability of the government (or its agents) to others. Monopoly: The size of the government, and the types of activity in which it engages, are important indicators of potential government monopoly and of the degree of corruption. There is a positive correlation between the size of a government—as measured by its share of GDP—and the level of expected corruption: the larger the share of GDP it gets its hands on, the larger the corruption that will emerge. A large government share of GDP is consistent with high levels of regulation and implies a large bureaucracy and a high level of red tape and of opportunity for malfeasance (LaPalombara 1994:338). As important as the size of the government are the types of activity in which it engages: a government that operates monopolistic state-owned enterprises or limits competition through excessive regulation or trade restrictions creates economic rents and therefore opportunities for corrupt rent-seeking behavior.3 Empirical research has shown that there is a positive correlation between corruption and the share of state-owned enterprises in non-agricultural GDP, and a negative correlation between corruption and the openness of economies measured by trade shares (Elliott 1997:182-183). Discretion: The larger the discretionary power of government officials, the larger the supply of benefits that may be subject to bribes. For example, government officials may be able to extract pay-offs from a contractor by introducing delays in payments (which can be expedited with a bribe) or by adding regulatory hurdles not in the original contract. They can also implement regulations inconsistently, extracting payments for clarity. They can also channel public resources to projects that are more prone to corruption than others (e.g., large infrastructure construction projects, military procurement) even though their contribution to national welfare may be lower than others. In privatization processes or in instances of natural resource concessions (e.g., concession to mine a certain ore, the ability to build a resort hotel in a particular beach or tourist attraction), government officials might be able to manipulate decisionmaking to favor a particular bidder who may be willing to pay a bribe to obtain the newly-privatized firm or concession (Rose-Ackerman 1997:39). Accountability: The accountability of the state (and its agents) to the public affects the degree of government monopoly and discretion and therefore the level of corruption. At one extreme, total absence of accountability over the state’s actions (or inaction) means that the state’s monopoly power and discretion are unchecked and there is high potential for corruption. Positive public accountability—in the form of transparency in government operations, including procurements; accounting standards; audits; grievance and appeal procedures; media scrutiny— inhibits monopoly, discretion and corruption. Empirical work on the economic effects of corruption has been limited by measurement problems. In a seminal study, Mauro (1995) used indices of corruption, red tape and the efficiency of the judicial system for about 70 countries compiled by a private investment rating agency to identify the channels through which corruption and other institutional factors affected economic growth and to quantify the magnitude of these effects. He found a statistically significant negative association between corruption and investment, as well as growth.4 In a subsequent study including 94 countries, Mauro (1977) found a reduction of corruption of 2.38 points on his 10 point corruption scale would increase a country’s annual investment by 4 percent of GDP and would increase annual growth of GDP per capita by 0.5 percent. • Corruption that requires that businessmen either pay an up-front bribe to start a business or are subject to payments of part of the proceeds of the investment by corrupt officials, acts as a tax that diminishes the incentives to invest (Wei 1997). Thus, this form of corruption lowers investment and retards economic growth significantly. However, because bribes differ from taxes in one crucial way, namely, unlike taxation, corruption is usually illegal and must be kept secret, corruption is more distortionary than taxation, creating opportunities for government officials to change the mix of economic activity toward those that can result in bribes (Sheifler and Vishny 1993:611-612). • To the extent that taking bribes is more lucrative than carrying out productive work, talent will be misallocated, with the more talented and better educated persons choosing to take jobs where bribes can be obtained rather than engaging in productive work. This misallocation of human resources has adverse consequences for the country’s growth rate. • Corruption in the form of the diversion of aid from abroad can lead foreign countries to reduce future aid flows, with a consequent adverse impact on the balance of payments and the overall growth rate. • Corruption in the form of tax evasion reduces government revenue and leads to ever-higher taxes on the limited number of firms that do comply with the rules. Higher tax rates, in turn, push firms to go underground (into the informal sector), reducing the number of tax-paying firms even more. The overall decline in government revenues limits the ability of the state to provide essential services, including the rule of law. • Corruption in government contracting can lead to lower quality of goods and services procured by the state. This may result, for example, in transportation disruptions or flooding of certain areas if low-quality construction services are used in infrastructure projects (e.g., bridges, dams) that subsequently fail. Supply stretching, another form of corrupt practice that lowers the quality of a product distributed by the state (e.g., adulteration of fertilizer or pesticides purchased by the state and distributed to farmers), can lower production yields or fail to curb destructive pests, with a negative impact on agricultural production (Alam 1990:91). • Corruption may distort the composition of government expenditures in favor of expenditures that are apt for bribe seeking (e.g., large infrastructure projects, military weapons procurement) and away from other forms of expenditures (e.g., salaries of teachers) that might have a more positive effect on public welfare and contribute to long-term economic growth. Tanzi and Davoodi (1997) found that political or “grand” corruption is often tied to capital projects, especially in weak or underdeveloped controlling or auditing institutions. Corruption distorts the decision-making process connected with public investment projects; it is likely to increase the number of projects undertaken in a country and to change their design by enlarging their size and complexity. The corruption-induced increase in public investment comes at the expense of productivity, and the net result is that public investment ends up having a negative impact on growth. • Corruption generally undermines the state’s legitimacy and leads to instability. Instability, in turn, has an adverse impact on the investment climate and private investment. Well-functioning public management systems, accountable organizations, a strong legal framework, an independent judiciary, and a vigilant civil society protect a country against corruption (World Bank 1997:39). These institutions tend to be very weak or missing altogether in countries undergoing a transition to market economies, particularly former centrally planned economies, which are highly vulnerable to corruption. Moreover, changes that accompany the transition can exacerbate the potential for corruption. One of the key features of socialist, centrally-planned economies (CPEs) is “the virtually all-encompassing public sector,” which includes not only the realm of high level government officials, but also the dealings of shop clerks (Heidenheimer et al. 1989:443). Under this system, “there is no distinction between public and private purses, and government officials simply ‘appropriate’ state assets” (Rose-Ackerman 1997:33). In the idealized socialist CPE, the totality of production facilities of the nation would be under state ownership. In practice, the degree of state ownership across CPEs has varied, but a common feature of each has been state control over the preponderance of productive facilities, with the exception of agriculture. Public ownership of productive facilities results in a lack of identifiable ownership and widespread misuse and theft of state resources. As an analyst of the Soviet system stated with regard to that country, but probably applicable to other CPEs as well, “most reliable sources agreed that theft of socialist (state) property is as widespread as state property itself” (Feldbrugge 1989:318). Individuals in these societies tended to use state property as their own, with very little stigma attached to it. The high degree of state ownership also means that relatively little private activity has been allowed. CPEs have myriad state regulations waiting to be broken by enterprising individuals with the connivance of corrupt government officials. The combination of the sheer size of the public sector, and the web of regulations that circumscribe private activity, create opportunities for illegal behavior and for the use of state property for private gain. • The overwhelming size of the public sector means that the state employs an inordinately large number of workers. Therefore, the potential for corruption is very large. • Central planning of hundreds of production enterprises, thousands of retail outlets, and tens of thousands of individual products and services requires a huge bureaucratic apparatus. At every turn, production and distribution decisions are regulated by inflexible plans and allocations procedures; enterprise managers often have little choice but to use illicit influence to get around planning strictures to obtain labor or raw materials. • The ruling party itself is often the locus of corruption, as the top leadership is normally immune to exposés and reprisals from below, and can engage in self-serving behavior. Actions or non-actions—by an individual or a small group of individuals occupying (an) official (party and/or state and/or legal and/or military and/or socially responsible) elected or appointed position(s)— that are perceived, at least by some criteria, to be improper or illegitimate in the particular sense of being seen simultaneously against the collective (societal) interest and in the official’s (officials’) individual (selfregarding) interests. 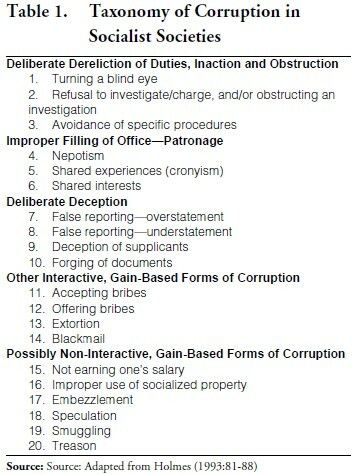 Based on this definition, Holmes developed a taxonomy of twenty different forms of corruption in communist countries (Table 1). It should be noted that two or more forms of corruption may be involved in a single act; for example, an official may forge a document in return for a bribe, or an official may refuse to investigate criminal activity carried out by a crony. The very extensive and personalized power in the hands of government officials in socialist societies translated into wide discretion to act in a corrupt manner: taking bribes, getting cuts or kickbacks, extorting graft. Exploitation of the power of an office for personal gain was enhanced by the dictatorial and secretive nature of the regime and mutual solidarity of members of the political elite (Grossman 1979:845). The new class instinctively feels that national goods are, in fact, its property, and that even the terms “socialist,” “social,” and “state” property denote a general fiction. The new class also feels that any breach of its totalitarian authority might imperil its ownership. Consequently, the new class opposes any type of freedom, ostensibly for the purpose of preserving “socialist” ownership. Criticism of the new class’s monopolistic administration of property generates the fear of a possible loss of power. The new class is sensitive to those criticisms and demands depending on the extent to which they expose the manner in which it rules and holds power. The privileged class of the former Soviet Union was able to draw on the resources of the state and to treat socialist property as its own: salary supplements, the best housing, special food allocations, access to restaurants, stores and other facilities, vacation country villas or dachas. It also participated heavily in the system of taking bribes in return for doing favors such as appointments persons to prestigious posts, protection, promoting people up the bureaucratic ladder, and using influence to stop the government from taking actions (Pérez-López 1995:24-25). As Naím (1995:251) points out, a corollary to Klitgaard’s stylized corruption equation is that the deepening of democratization should have corruption curbing effects. Why, then, is there a perception that corruption is rampant in countries transitioning from authoritarian, centrally-planned regimes to democratic, market economies? One explanation for this phenomenon is that in the absence of strong institutions, democracy and free markets provide more—and more visible— opportunities for corruption than those present under authoritarian rule. Under authoritarian rule, corruption can be more institutionalized, controlled and predictable. Naím argues that a well-organized dictatorship can provide “one-stop shopping” for corruption services, where the right amount of money given to the right official will take care of all needed interventions. Under this system, bribe takers under the control of the authority (either the authoritarian leader or a political party) collude and keep their actions out of the public’s view. Under a democratic system, in contrast, the central government’s control over the providers of bribery services is diluted and corrupt officials compete for bribes, resulting in a process which is more visible to the public than under authoritarianism. Corruption in these emerging markets is double pernicious. First, it compromises the efficacy and efficiency of economic activity, making the transition to free market democracy more difficult. Second, and equally important, corruption distorts public perceptions of how—and how well—a proper market economy works. Under such circumstances it becomes all too easy for economically beleaguered publics to confuse democratization with the corruption and criminalization of the economy—creating fertile soil for an authoritarian backlash and engendering potentially hostile international behavior by these states in turn. It is probably fair to argue, however, that democratic regimes, over the long run, engender more powerful antibodies against corruption than authoritarian systems under which political liberties are stifled (Glynn et al. 1997:11). Decentralization: The relaxation of the state’s economic monopoly creates novel opportunities for rent-seeking by government officials. For example, the economic opening brought about by perestroika in the former Soviet Union that legalized some secondary markets translated into an increase in corruption and black market activity, as government officials diverted scarce (and low-priced) goods from the distribution system and into secondary markets where they could gain rents from resale (Schuknecht 1990). Deregulation of areas that were formerly under the exclusive control of the state create opportunities for fraud until a regulatory structure is established. Privatization: Privatization, the transfer of stateowned property to private owners, provides manifold opportunities for rent-seeking and misconduct by government officials. The experience of reforming countries of the former Soviet Union and Eastern Europe undergoing massive privatization has been of an increase in corruption, leading analysts to question of whether corruption is the is the inevitable price to pay for privatization (Kaufmann and Siegelbaum 1997:421). Opening to International Participation: The opening of the economy to international participation—through increased international trade and investment—creates opportunities for corruption particularly in the form of “commissions” for issuing import and export permits and authorizations or allocating foreign exchange or for misclassifying goods to obtain more favorable tariff treatment. The approval process for foreign investment, particularly if it requires a multitude of discretionary permits, is fertile ground for corruption. Examples of corruption in former socialist, centrally planned economies during transition to market economies abound. In the early 1990s, corruption was rampant in Romania: bribes were common for making reservations in hotels, renting real estate, or getting a grave in a cemetery. Hungary was affected by severe smuggling, counterfeiting and tax cheating. Describing priorities for 1995, a Vietnamese Communist Party leader told a Cuban journalist that “we must also give special attention to new issues emerging from the process of changing to a market economy, including fund embezzlement, squandering, and, above all, corruption, illegal commerce, and other crimes and social vices” (Pérez-López 1997:181). In China, corruption became a major issue in the 1990s. Many bureaucrats in agencies such as the bureaus of finance, foreign trade, industries, material supplies, commerce, and construction projects and land approvals accepted bribes. Government officials took advantage of China’s ambiguous economic system—neither completely centrally planned nor completely market—to abuse their position and power and speculated in raw materials and finished products through the dual pricing system. Among many corrupt practices, government officials “sold” valuable parcels of land to well-connected businesses at bargain prices (Hao and Johnston 1995; Johnston and Hao 1995). In Russia, the process of privatizatsia (“privatization”) was nicknamed prikhvatizatsia (“grabitization”) to highlight the high degree of corruption that it involved; it has been estimated that 61 percent of Russia’s new rich were former Soviet managers who made their own the industries they managed during privatization (Naím 1995:253). With the loosening of the restraining hand of the KGB, the Soviet Union’s once-illegal “shadow economy” came into its own as the mafiya (Malia 1995). Capitalizing on corrupt officials, organized crime in Russia—the mafiya—has acquired large holdings of state assets through criminal and violent methods and has broadened its reach to over two dozen countries, including the United States, Canada and Sweden. Since the early 1960s, the Cuban state has controlled the overwhelming share of the nation’s productive resources. In 1968, the Cuban state already controlled 100 percent of industry, construction, transportation, retail trade, wholesale and foreign trade, banking and education; only in agriculture—70 percent under state control—was there a sizable private sector presence. By 1988, the state’s share of agriculture had risen to 92 percent (Rodríguez 1990:61). Although precise comparisons are difficult to make, available information suggests that in Cuba, the state’s share of ownership of productive resources was as significant, if not more so, than in other CPEs, including the former Soviet Union, East Germany and Czechoslovakia, as well as socialist Hungary and Poland. Similarly, the Cuban economy also has been subject to Soviet-style central planning since the early 1960s. In early 1961, a Central Planning Board (Junta Central de Planificación, JUCEPLAN) was created and charged with formulating annual and longer-range plans. A network of central ministries and agencies was created, or the mandate of existing ministries modified, to take charge of the various economic sectors, mostly in the form of state monopolies dealing with foreign trade, finance, labor, and banking. State enterprises producing the same type of good were merged into trusts (consolidados), each controlled by a central ministry. Centralization took a quantum leap in 1962, when the government imposed strict controls on prices, put in place a commodity rationing system, and set quotas on the output of private farmers that the latter had to sell to the state at predetermined prices (acopio). There is, of course, very little information on the breadth and depth of corruption in Cuba. It stands to reason, however, that corruption in the island would follow closely the patterns in other socialist, centrally-planned economies whose ideology and political and economic systems Cuba emulated. Illegal economic activities associated with corruption for which some concrete evidence is available are black market operations, misuse of office, and special perquisites extracted by the Cuban nomenklatura. To be sure, other forms of corrupt behavior—e.g., bribes to influence government decisions such as installing a telephone or exchanging homes (permutas)—were probably also rampant, but they are more difficult to document. Black Markets: Black markets for consumer goods began in Cuba in 1962 when commodity rationing was instituted. Despite periodic crackdowns and heavy sentences imposed on black marketeers, these illegal markets have remained an important source of consumer and industrial goods and services. Because prices in the black market are substantially higher than in official markets, there is a significant incentive for black marketeers to ply their trade and for corrupt government officials to provide goods to supply this market. The Cuban state’s overwhelming control over the economy translates into black markets in nearly all areas of economic activity. Thus, not only are there black markets for food and consumer goods—items ostensibly covered by the rationing system—but also for construction materials for home repairs and spare parts for appliances and motor vehicles. Misappropriation of government resources (via theft, diversion of goods, short-changing of customers) has traditionally been one of the main sources of goods entering black markets. Misuse of Government Office: The extremely high concentration of resources in the state, and the centralized nature of the decision-making system, place a great deal of power in the hands of government officials and hence create ample opportunities for corruption. In addition to corrupt behavior in return for bribes, corruption in socialist Cuba takes the form of using power to obtain access to other things, degenerating in a generalized “I’ll scratch your back if you’ll scratch mine” system that rewards those who are friendly with government officials and is generally referred to as sociolismo, a take-off on socio (buddy) and socialismo. General Prosecutor of the Republic Ramón de la Cruz Ochoa told a journalist in 1991 (Carrasco 1991:27) that Cuba’s corruption problem was sociolismo organizado, sometimes used to solve enterprise problems and other times to solve personal problems. These corrupt practices tend to build on each other and bring about a lack of respect for rules and laws. The economic crisis that has enveloped socialist Cuba in the 1990s has brought about changes in the form and visibility of corruption. Some of the economic policies implemented during this period— particularly since 1993—that opened up some space for the private sector in the absence of well developed property rights and legal institutions have also created new opportunities for corruption. The legalization of the use of foreign currencies and the enthusiastic pursuit of foreign investment in order to ease very serious balance of payment problems, have been among the policies most directly responsible for the government’s concern that corruption is rampant and a threat to the socialist system. Misappropriation of Public Goods: Pursuant to legislation adopted in September 1993, Cuba authorized self-employment in over 100 occupations subject to certain restrictions and fees; an additional 18 occupations were added in October 1993. Despite the restrictions—university graduates and managers were not allowed to be self-employed, health and education services were outside of the scope of occupations authorized for self-employment, self-employed individuals cannot hire paid helpers—self-employment increased rapidly, reaching nearly 209,000 workers in December 1995. Particularly impressive was the growth of home restaurants, the so-called paladares, that sprung throughout the island: an estimated 1,000 to 2,000 such outlets in the city of La Habana alone and 4,000 nationwide (Pérez-López 1995:182). Cuba has no wholesale distributors. The Cuban government has not opened up supply markets. Intermediaries are not only illegal, but unwanted. … When Jorge [a self-employed shoemaker] is asked about where he has been buying the little equipment he uses to work, he answers coyly, “little by little I have been collecting it,” but his smile seems to say, “Why are you asking such a dumb question?” And it is, in fact, a silly question. Everybody knows that there are no free markets for any of the instruments used by Jorge; nor are there supplies for most of the products the artisans make. They either taken them from their workplaces (in other words, steal them) or they buy them in the black market. Where do the products in the black market come from? From other workers who do the same thing. Everyone has to steal in Cuba for survival (Jatar-Hausmann 1999:108-109). “Spontaneous Privatization”: Although the Cuban leadership has stated unequivocally that it will not stray from the path of socialism and privatization is out of the question,7 the latter is in fact already occurring through a method that is “the very essence of corruption, being the outright theft of public assets by politicians and/or enterprise directors associated with the nomenklatura” (Kaufmann and Siegelbaum 1996:439). “Spontaneous privatization” refers to the appropriation of state property by members of the nomenklatura through the paper reorganization of state-owned enterprises into “private” corporations of which the nomenklatura members are owners or directors. For Hungarian political scientist Agh (1993:15), spontaneous privatization is a phenomenon that occurs at a time when state socialism has weakened but while there are still legal gaps and uncertainties in property regulations. In a period of uncertainty, “those possessing economic power carve out for themselves and their clients valuable pieces of the state-owned cake” (Sik 1992:158). By the end of 1992, reportedly 63 privatized entities called sociedades anónimas (known by the initials S.A.) were operating in Cuba (Gunn 1993:13). Some of the leading S.A. and their main activities and holdings are given in Table 2. 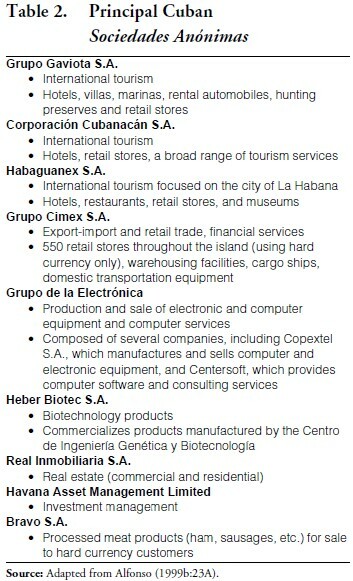 Although some claim that these corporations are privately owned, they are in fact instruments of the Cuban state. Their “owners” have not purchased assets from the state nor have they contributed intellectual property, invested any savings or incurred any risks. Instead, they are individuals loyal to the Cuban government who have been given control over state assets illegally in a manner reminiscent of the systematic theft of property by the Sandinistas in Nicaragua known as la piñata. These sociedades anónimas operate in the more dynamic sectors of the economy that generate hard currency and are capable of attracting foreign investment: tourism, foreign trade, biotechnology, commercial real estate, financial services. The “owners” and managers of the sociedades anónimas are predominantly high-level military officers and Cuban Communist Party officials (Alfonso 1999b:1A). The rise of this “capitalist” class is full of ironies. Ramiro Valdés, one of the revolutionary leaders with the longest association with Fidel Castro8 and the feared former Minister of Interior, is the head of the Grupo de la Electrónica, which controls the production, sale and imports of electronic products and services and computer hardware and software. Valdés reportedly lives in the island in luxury and travels frequently to Spain, where he stays in first-class hotels, dines in “five-fork” restaurants, and has purchased expensive properties, including a large farm in Asturias (“Un señorito” 1999). Misuse of Office: The visible rise in corruption associated with bribe-taking and misuse of office, particularly associated with the international tourism industry and other sectors of the economy that operate with foreign currencies, has triggered steps within the Cuban government and the Cuban Communist Party to address the most obvious excesses. According to the Cuban press, the Cuban Communist Party conducted 1,159 investigations in 1998 of allegations of “diversion and misuse of state resources” (439 investigations), “lack of economic controls, irregularities and lax management” (247) and “social conduct unbecoming of a Party militant” (170). About 1,500 members of the Cuban Communist Party were sanctioned in 1998 for corruption (Rousseau 1999). Overall, in 1998, the Cuban Communist Party reportedly received 21,828 complaints regarding misappropriation of public goods, lack of management controls, abuse of power and conduct unbecoming a Party member; 77 percent of the complaints were at least partly justified (Tamayo 1999a). • The head of the hotel division of Cubanacán. • The manager of a large warehouse operated by Cubalse (Cuba al Servicio de Extranjeros), the firm that rents housing and sells dollar-priced goods to foreigners living in Cuba, such as cars, furniture, office supplies and foodstuffs. • The director of the Valle de Berroa free trade zone, operated by Cimex. • One foreign travel agency operating in Cuba and several of the firms located in free trade zones. In what may be a related development, on August 28, 1999, the Cuban media reported that Minister of Tourism Osmany Cienfuegos had been replaced by former Minister for Foreign Investment and Economic Cooperation Ibrahim Ferradaz (“Council of State” 1999). The crackdown on corruption has also extended to other sectors of the economy, with three top officials at the Hermanos Ameijeiras Hospital—run by the Cuban Communist Party, whose services are only available to Party members and foreigners able to pay with hard currency—reportedly being fired or forced to resign because of allegations of corruption. Allegations of corruption have been floated with regard to the recent announcement that the long-term head of the Centro de Ingeniería Genética y Biotecnología, Dr. Manuel Limonta, had been replaced. Finally, a Canadian investor has stated that three Cuban officials who took a $200,000 bribe from a Canadian firm involved in an airport construction project had defected in Ottawa “to enjoy the fruits of their corruption” (Tamayo 1999b). As has been discussed in the previous section, the limited economic liberalization policies introduced by the Cuban government in the 1990s have brought about marked changes in the nature of corruption. In addition to the more traditional forms of corruption associated with socialist, centrally planned economies, the opening of some space to non-state economic activity has created new opportunities for corruption, which government officials have been quick to exploit. Whether there has been an overall increase in corruption in the 1990s or merely a shift to more visible forms of the same ill is difficult to assess. Cuban economist Marta Beatriz Roque Cabello (1997) argues that corruption in Cuba is generalized and that corruption is inherent in the island’s socialist system. It is clear, however, that the corruption eruption that so worries Cuban leaders is a harbinger of what might occur with the implementation of broadbased policies to transform Cuba into a market economy unless explicit efforts are made in the design of transition strategies to reduce opportunities for corruption. Policies that open up and liberalize the economy and promote competition limit state authority. These policies can be powerful tools in combating corruption. They include liberalization, privatization, and competitive procurement policies. Liberalization: Some macroeconomic reforms and deregulation can contribute to the expansion of markets and reductions in rents. Lowering or eliminating tariffs, quotas and other barriers to international trade as well as eliminating exchange rate restrictions, price controls and unwarranted permit requirements strip government officials of the power to extract bribes. At the same time, removing such controls reduces transaction costs, eliminates bottlenecks and fosters competition. Privatization: Privatization removes the government from economic activities and reduces opportunities for corruption in sales, procurement, employment and financing. In practice, privatization processes have proven to be vulnerable to corruption, as they can be manipulated by government officials to favor certain individuals or groups or even to benefit themselves. The most corrupt form of privatization is the outright theft of public assets that occurred in Eastern European countries shortly before their shift to market economies that has been euphemistically called “spontaneous privatization.” To ensure the integrity of privatization, transparency measures must be an integral part of such processes. Privatization must also be accompanied with legal regulatory and commercial frameworks that promote competition and protect consumers and investors. In the absence of such frameworks, privatization merely shifts rent seeking from governments to the private sector. Competitive Procurement: Competitive government procurement removes the discretion of government officials from the selection of government suppliers and contractors by prescribing an open bidding process and laying out clear procedures and criteria for selection. Donors of foreign assistance often require recipients to adopt competitive procurement procedures in order to avoid foreign from being diverted from their rightful purpose and enriching government officials. A country’s legal system—its laws and regulations, as well as the processes and institutions through which they are applied—is vital for controlling corruption, just as it is vital for resolving legal conflicts, enforcing property rights, and defining the limits of state power. Without enforcement, however, laws and regulations have no impact on reducing corruption and may foster general cynicism about reform efforts. Enforcement of anticorruption legislation requires an efficient, predictable, and accountable judiciary. To hold public officials accountable to anti-corruption laws, judiciaries need independence from the executive branch as well as institutional capacity. Strengthening judicial independence involves revising procedures for appointing, assigning, remunerating and removing judges and prosecutors to insulate them from political influence. In some cases it might require the establishment of independent prosecutors to carry out investigations of senior officials. Strengthening the institutional capacity of the judiciary involves, among others, modernizing court system to facilitate swift and fair procedures through augmenting and upgrading staffs, improving legal training, and strengthening investigatory capabilities. A well-performing government inhibits corruption. A professional and well-motivated civil service, with selection and promotion based on merit rather than patronage, can serve as the foundation for good governance. A well-performing civil service resists petty corruption and provides the human resources for many of the institutions that protect integrity in the government: finance and personnel ministries, procurement boards, technical departments that issue permits and licenses, regulatory bodies, and internal and external audit departments. Adequate payment of civil servants and independence of the civil service from unwarranted political interference are two key issues. Good financial management systems are powerful instruments for preventing, discovering or facilitating the punishment of fraud and corruption. They reduce opportunities for corruption and increase the risk of detection, making corrupt behavior high-risk. Such systems are critical in area of government service that are particularly susceptible to corruption, such as tax and customs departments and government procurement and contract management systems. Improving accountability entails efforts to improve both the detection and the sanctioning of corrupt acts. Better detection requires measures to improve transparency and oversight while better sanctioning involves establishing criminal and administrative sanctions and improving electoral accountability. Among specific measures that improve transparency and oversight are freedom of information requirements; financial disclosure requirements; open budget processes; financial management systems and audit offices; independent auditors and ombudsmen; and special anticorruption agencies. Better sanctioning of corruption can be accomplished through vigorous legislative oversight; establishment of fraud hot lines; strong protections for whistleblowers; clear and meaningful sanctions; and free and fair elections that hold public officials accountable. In addition to institutional reforms, successful efforts to fight corruption require societal reforms to change public attitudes toward formal political processes and to energize political will for change. Societal reforms generate new information about the costs and causes of corruption to stimulate demand for change and provide guidance on what to change. Societal reforms also foster structures to facilitate monitoring and advocacy by civil society. Without the mobilization of civil society, governments are unlikely to follow through on anti-corruption reforms once they enter difficult political terrain. Among the ways in which civil society can be energized to engage in the fight against corruption are surveys of perceptions and attitudes toward corruption and ways to control it; public relations campaigns and workshops to educate the public on the costs of corruption and best practices to control it; investigative journalism that exposes egregious forms of corruption; civil advocacy organizations; and international agreements and conventions. 1. I am grateful to Roger Betancourt and Luis Salas for comments on an earlier version. The paper presents only the personal views of the author. 3. Rents are payments to factors in excess of normal returns in competitive markets. The term “rent seeking” to describe the behavior of corrupt government officials who take advantage of imperfectly competitive markets to seek bribes was pioneered by Krueger (1974). 4. Under some circumstances, corruption may not be inimical to economic development, for example where there is an inept or understaffed bureaucracy or inefficient regulators, or where the rule of law is weak and there is no effective means of contract enforcement (Elliott 1997:186). For an illustration of the latter in China see Betancourt (1998:162-164). 5. This section of the paper draws heavily from Pérez-López (1995 and 1997). 6. The best treatment of this subject is the work by Clark, who has conducted several surveys of emigrés. Among his works, see Clark (1990 and 1999). 8. Valdés participated in the 1953 attack on the Moncada Barracks; was a member of the expeditionary force that landed in Cuba in 1956 aboard the Granma; rose the rank of comandante, the highest rank in the Rebel Army; became military commander of the province of Matanzas in 1959; and was appointed head of intelligence (G2) in 1962. 9. Among the Rumbos executives dismissed for allegations of corruption is María Elena García, wife of former Minister of Foreign Relations Roberto Robaina (Alfonso 1999a). 10. This section of the paper borrows liberally from World Bank (1997) and USAID (1999).